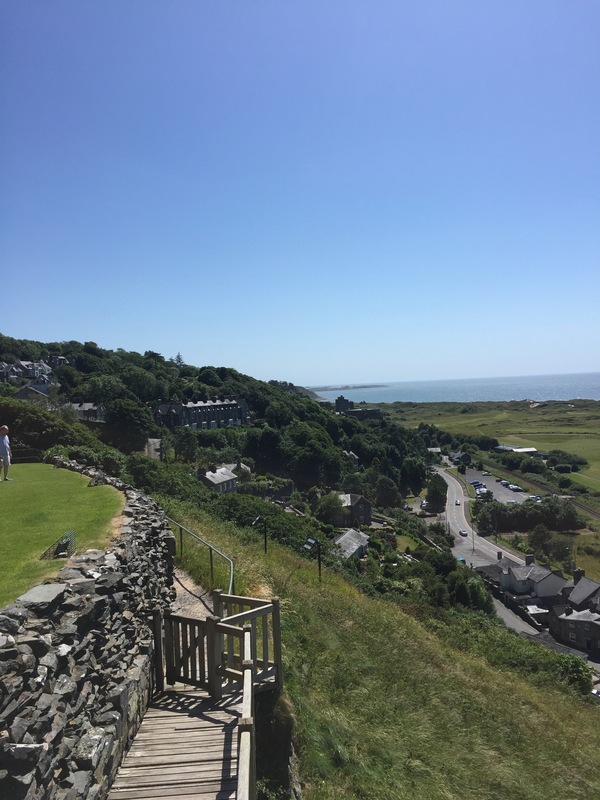 Apart from its sheer presence in the landscape, the castle at Harlech has a location that is breathtaking – perched high in the elevated centre of the small town, looking back down the valley at a vista that embraces the area of Porthmadog, then slides your eye leftwards to take in the whole of the Lleyn Peninsula. On our scouting trip in May, we had searched for a location that would meet the needs of the third of our main themes: authority. Our first sight of Harlech Castle decided it. Seen from below – a straight line of a road that runs close to the magnificent beach – it appears that the castle sits on top of the hill with little else around it. In fact, it is in the centre of the town; logical, as the modern town has developed around it from early times. There are two roads (photo below). One follows the line of the sea, the other climbs a slow and winding curve through the lush Welsh countryside and enters the town at its heart. Parking is a challenge, but the castle and associated tourist centre offers a small number of places directly adjacent to the castle grounds. How do we react to authority? It depends on many things, including age. As young children, the authority of the caring adult is paramount in the relationship by which that child is moulded to fit into its society. This is seen as necessary, yet robs us of much of our spiritual originality. Most would agree it is essential for the child’s survival and prosperity, even though, beyond the original love of the home, it forms the first great ‘container’ of reactions that eventually create the personality. From there on, that hard container is wrapped around the soul in an increasingly dense way. 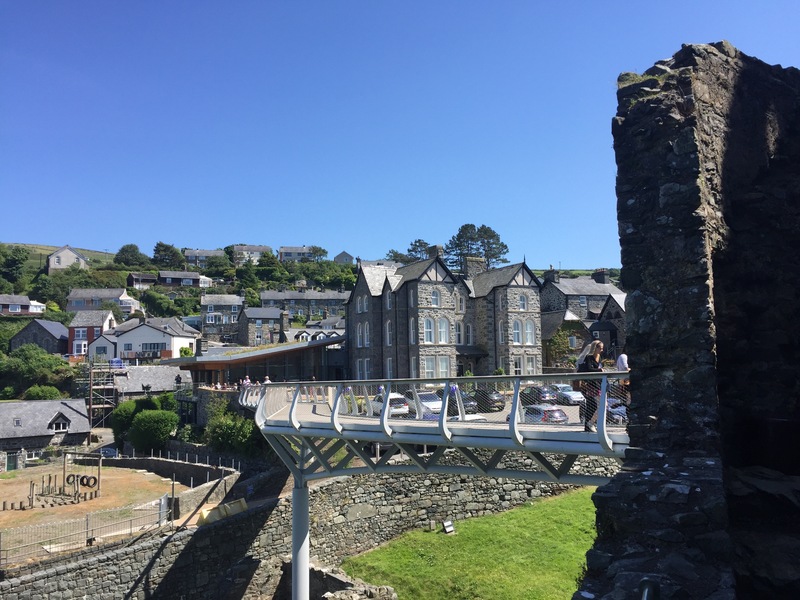 As a child, holidaying in Wales, and captivated by its beauty, I marvelled at how many castles this ancient race had built to defend themselves, little knowing that this was completely wrong. 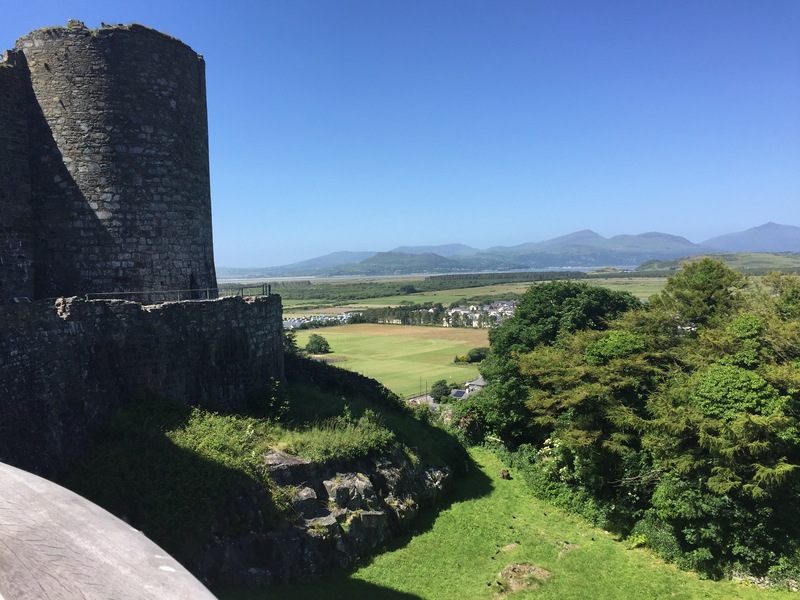 Most, if not all of the Welsh castles were built by English kings, such as Harlech Castle’s creator, the military and battle-hardened Edward I. Their purpose was to provide fortified and administrative outposts for the English ruling class, in a country transformed by 1066 and the Norman conquest. 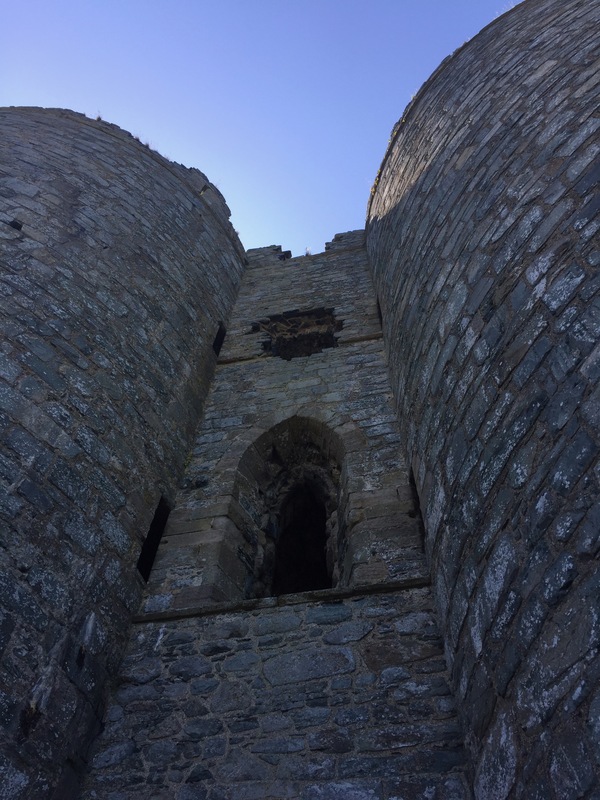 Edward I built Harlech Castle to secure the lands he had won from Llywellyn of Grufford, the Prince of Wales. For two-hundred years after the Norman invasion, there had been continuous wars between the conquering Marcher lords and the Welsh princes. In 1267, the Treaty of Montgomery recognised Llywelyn as Prince of Wales, in return for annual tributes and subservience. Llywelyn later lost most of his power an authority in further skirmishes which cost him all but his title. When you realise that you are inside a foreign power’s redoubt, the secure and ruthless architecture takes on a different flavour, and there is a sadness that such a proud and folklore-rich race lived under the English yoke in such a bloody way; though it is probably true that the Welsh of that time were as warlike as the English. The model above shows how the castle was originally created. Much of it remains, as least as a visitable ruin. The model illustrates that, at the time of its construction, between 1283 and 1289, the castle was next to the sea, whereas today the long line of dunes constitute a barrier of nearly a mile between the lower part of the castle (and the foot of the town) and the coast. Our final act within the castle was to climb the spiral stairway of the west tower – something that proved quite a challenge. Breathless, we reached the top, to gaze in wonder at the commanding view it afforded. Very little could be hidden from the eye based here. One might say the same about the way our own governments seem hell-bent on overseeing all our lives, in the name of such ’causes’ as safety and terrorism. Same psychology, different mechanisms. Our group had split into two to explore the small town. We reunited at the famous ice-cream shop and were to be found, silent and entranced, sitting outside the shop/cafe in the Welsh sunshine. Two parts of our Saturday remained. 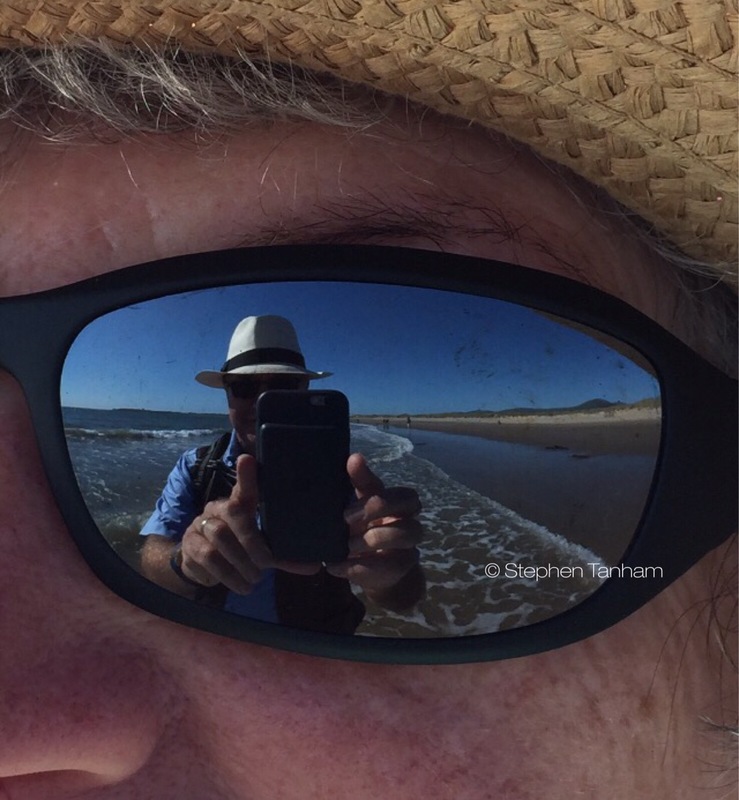 One – the finale – was still unknown by all but two of us; the other followed the castle visit as we gathered on the quiet end of a beach, two miles south of Harlech, to admire the sun, now descending towards the western sea, and shared our final readings of the day. Thank you, Madelyn. True freedom is dear to both our hearts, I can tell!